Sometimes when designing new things, I need to go back and retrospect my past work. And that is when I remembered I stopped blogging. This calls for a new design. 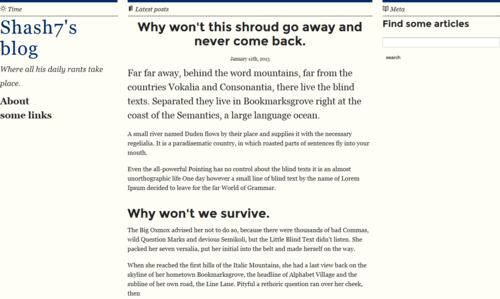 But this is more of a revitalization of the old blog theme. The new redesign takes elements from the old theme and removes unnecessary clutter. The header font is still montserrat mainly because it complements georgia Merriweather so beautifully. The most drastic yet minimal change would be the color scheme. In the past, I used to write down hex codes on a pad. Now after making colorbook, it has become an indispensable tool for designing color schemes. Also, since I started using LESS, managing different color codes and other random variables has become much easier. Another tool I used is gulpjs. My whole workflow is automated to minify and automatically inline css inside html. The result : It is better than the old one while still retaining its style and simplicity. Last night, I was at a pub with a good friend of mine. We were discussing what is the next best thing in tech. In a semi-drunken stupor, I replied that we are not going through a revolution with tech, only evolution. Sounds really cheesy but here is what I have observed. Mobile phones have been around since the 1980s. They aren’t going to go away anytime soon. But the way we interact with the device has changed. Earlier, we had hard physical buttons which has been replaced by touchscreens. Maybe in the future we will have holograms and voice only interaction for some devices. But the medium will stay.